OK, so you can't afford company drivers, cushy relocation stipends, free daycare or even one of Google's 11 gourmet cafes. No matter. There are plenty of ways to honor employees' hard work. Just take a cue from the creativity at some of these small firms. Zutano, a Cabot, Vermont-based children's clothing and toy design company with 35 employees, has welcomed in-office babies for the past eight years. The program started because the company feared losing its production manager, Denise Towne — a keystone in daily operations — to an extended maternity leave. Since then, more than 20 babies have successfully come through the office. "We've found that employees are more productive with their baby by their side than those who are worried about how their child is doing in day care," says Michael Belenky, company president. Further, he says, the company has fewer liabilities with the babies in the office than it would with a company-sponsored daycare. Clearspring, the creator of the AddThis social sharing network for publishers in McLean, Virginia, encourages its 60 employees to take the time to clear their heads. To help, the company stocks a game room with Wii and Xbox systems as well as a foosball table. "We've sought to make the office an incredibly comfortable place from the start," says Hooman Radfar, company CEO. Given the long, and odd, hours that employees tend to work, the company knew it was important for employees to enjoy being in the office, and to have an outlet for relaxation while rejuvenating their creative juices. Other office perks include a beer and Red Bull fridge, an espresso machine, a movie-style popcorn machine, and free meals. With 11 employees and annual revenue of less than a million dollars, Thumbtack — an online marketplace for local services based in San Francisco — can't afford the luxurious perks its counterparts in the Silicon Valley can. "We wanted to spend our perk money wisely. So we thought, let's feed everyone great food. As much as possible," says Sander Daniels, company co-founder. The company's Le Cordon Bleu-trained in-house chef prepares lunch every workday, as well as dinner three times a week. The program is such a hit that employees even created a blog to document the daily feast. Pets are welcomed, and encouraged, at the Petplan office in Philadelphia. "The pets bring a sense of fun and engagement to the office," says company co-founder, Natasha Ashton. "More often than not, when people take breaks they'll play fetch with a dog in the corridor, or take a dog for a walk." When Natasha and her partner, Chris, started the pet insurance company in 2006, it was critical that they be able to take their Cavalier King Spaniel, Wellington, to work each day. "We treat people how we want to be treated ourselves," Natasha says, thus the policy was born. About 90 percent of the company's 50 employees have brought a pet to work at some point, and when Natasha mentions the policy in a job ad, her mailbox floods with pet-loving applicants. Threadless, the Chicago-based graphic t-shirt design company, is housed in a 25,000 square foot industrial building, but the space is far from concrete and steel. "Our office could be described as a theme park for creativity," says Cam Balzer, the company's chief marketing officer. 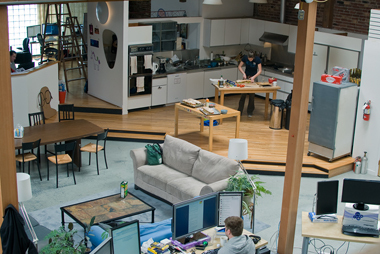 The office, which The Travel Channel featured on its "Most Extreme Workplaces" show, includes a basketball court, a skateboard ramp, two kegerators, ping-pong tables, and arcade games. Further, Threadless gave a stipend to each department to decorate its area, which resulted in innovative themes ranging from urban jungle to disco room. "Often, people stay late just because it's an awesome place to be," Balzer says. At Lurie Besikof Lapidus & Company, a CPA firm in Minneapolis, tax season is arduous, so the company asks its 100 employees what amenities would make the day-to-day more bearable. This year's most unique request was an inflatable punching doll to blow off stress. Standard perks during tax season include in-office massages, dry cleaning services, and a raffle for house cleaning services. "People put in an intense amount of hours during tax season, so we do whatever possible, within our budget, to lighten the mood," says the firm's HR manager, Tom Morin. "It has become something people look forward to."